Proprietor Paolo De Marchi has left an indelible and highly personal stamp on Isole e Olena and all of Chianti Classico, for that matter. Originally of Piedmontese descent, De Marchi stands apart from many of his colleagues for his vocal opinions and intense dedication to the vineyard above all else. Since taking over his family's estate in the late 1970s, De Marchi has transformed Isole e Olena into a powerhouse. The flagship Cepparello is 100% Sangiovese aged in French oak barrels. This nearly complete vertical charts the history of one of Tuscany's most compelling wines. The first Cepparellos were vinified in cement. The cellar was heated to induce malolactic fermentation and the wines were subsequently aged roughly equal parts Slavonian oak casks and smaller French oak barriques, with a dollop of chestnut barrels thrown into the mix. It was a time of enormous sacrifice, given that green harvesting was viewed as throwing money out the window, and every purchase of new French oak barrels was accompanied by a stern reprimand from De Marchi's father to pay attention to costs. But De Marchi persevered. The fruits of his hard labor and pricing are amply captured in these magnificent wines. Over the years Cepparello has acquired a level of finesse it rarely had at the outset. Some of the refinements include giving the wines more air in vinification and an increase in the period of elevage in oak from 12-14 months to 18-20 months, which is the norm today. 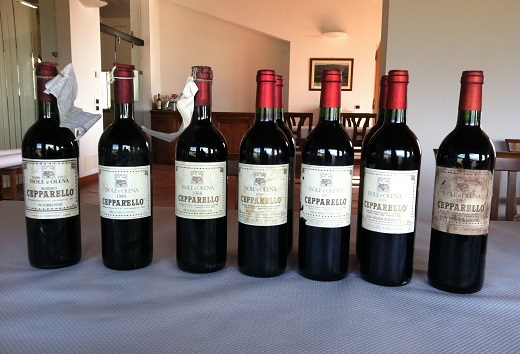 De Marchi says he started getting better quality oak around 1993, but it is the increased age of the vineyards themselves that have given Cepparello its finesse.